YouTuber Felix 'PewDiePie' Kjellberg is back in the spotlight again, foregoing no opportunity to peddle some merchandise. The Swedish star has partnered with UglyChristmasSweater.com to create a line of Christmas-themed products. 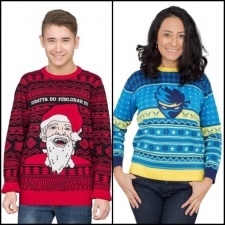 The main event of the line is an incredibly gaudy red and black festive sweater, featuring a cartoon Kjellberg dressed as Santa under the caption 'skratta du förlorar du', which means 'you laugh you lose' in Swedish. If you've got enough Christmas sweaters, there's a matching pair of joggers, a onesie, and two different beanie hat and sock designs. The items range from $19.99 to $69.99 and can be picked up here, just in time for Christmas. If PewDiePie's particular brand of comedy isn't for you, Fortnite star Tyler 'Ninja' Blevins has also released a line of festive products. 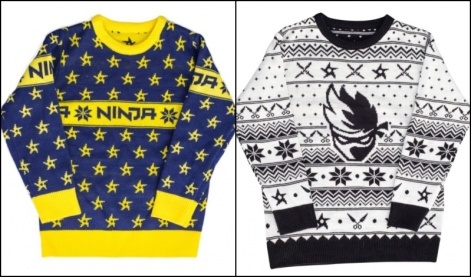 Similar to Kjellberg's, Blevins' range features three ugly Christmas sweaters - one black and white (which we don't hate) and one blue and yellow design featuring Blevins' logo, and another sweater with a star motif. All of the sweaters come in adult and children's sizes. There's also festive socks and festive scarfs available to purchase. Blevins' range launched yesterday and is available to buy here. The prices range from $19.95 to $69.95.